This plot shows the evolution of the horizontal magnetic field components within the last four hours. Depending on the activity within the last hour, green/yellow/red alerts are displayed in plot. This plot shows the derivative of the magnetic field evolution, dB/dt. Peaks in it hint at a fast change of the magnetic flux, which is a neccessary condition for the occurrence of polar lights. Depending on the activity within the last four hour, green/yellow/red alerts are displayed in plot. In the plot, also high values of the second derivative, d2B/dt2 will be marked (by arrows). These characterize rising and falling wings of magnetic substorms, and may allow to identify a substorm earlier than just the first derivates. This plot shows the usually published components of the magnetic flux vector, H and D. Once SAM Viby will be promoted to a 3-D readout, also F, I and Z can be derived. The data format follows the format put forward by the German magnetometer network at polarlichtinfo.de. This network provides a central data analysis of German SAM stations. By a common analysis false alarms of individual stations can be effectively avoided. These data resemble dB/dt data with a step width of Δt=5 min, which can be useful for aurora borealis prediction as put forward in a blog by Steve Marple of Aurorawatch UK. 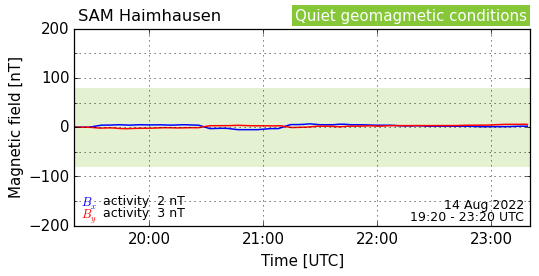 To facilitate an online analysis for central/northern Europe, recent magnetometer data is provided here. These data describe te evolution of the horizontal components of the local magnetic field within the last hour.